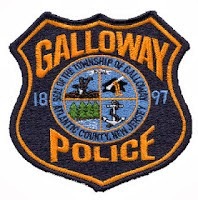 Galloway Township Police responded to 786 calls for service during January 19, 2014 through January 25, 2014. Additional statistics include: 6 Burglaries, 24 Motor Vehicle Accidents, 16 Tickets issued, 0 Driving While Intoxicated, 13 Arrests, 12 Domestic Violence, n/a Fire Calls, n/a EMS Calls and 1 Juvenile call. January 19, 2014 at S. Spruce Ave.
January 20, 2014 at Buchanan Ave.
January 22, 2014 at S. New York Rd. January 23, 2014 at S. Cape May Ave.
Charles H Ayers III, 35, of Hamilton Twp. was arrested by Ofc. Gary Brenner for aggravated assault, possession of a weapon for unlawful purpose, and threats or use of physical force against L.E.O. on January 19. Joshua M. Heaton, 25, of West Berlin was arrested by Ofc. Przemyslaw Ryba for possession of CDS on January 20. Jahbri A. Bazemore, 18, of Atlantic City was arrested by Ofc. Kerry Baerman for hindering apprehension on January 20. Tyisha L. Lassiter, 21, of Hamilton Twp. was arrested by Ofc. Kerry Baerman for distributing heroin and possession of CDS on January 20. Rudolph C. Mayer, 27, of Vineland was arrested by Ofc. Ronald Gorneau for possession of less than 50 grams of marijuana on January 25. A 16 year old male from Hamilton Twp. was charged on January 20th by Ofc. Bill Kline for burglary, theft, criminal mischief, possession CDS, and possession of less than 50 grams of marijuana.